If you want to survive the wilderness and make it through ancient tombs in one piece, it's best to be in tip-top shape. 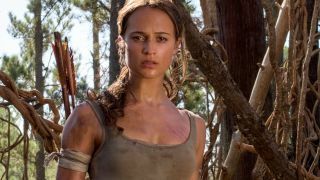 So Academy Award winner Alicia Vikander got absolutely ripped for her starring role as Lara Croft in Tomb Raider, the film adaptation of Crystal Dynamics' 2013 reboot, coming to theaters March 16. As with the modern games, this Tomb Raider follows Lara on her first adventure into the great unknown, searching for her lost father on the mysterious island of Yamatai. We got the chance to chat with Vikander about how she connects with the Tomb Raider series, what it was like being Lara Croft, and what she plans to do with her Oscar statue. The answer to that last question is unconventional, to say the least. GR: What was your first experience with Tomb Raider? Alicia Vikander: "I did not have a Playstation at home, sadly - but with my family friends, the boys in their family had a Playstation. I was probably I think around 10ish when I came there. I remember I looked at the TV screen and I had never seen a girl, a woman being the protagonist in a video game and was thrilled and stood there just watching. They wouldn't really let me play [laughs], but later on I got the chance. I mostly spent my time back then in the Manor training, because I came to a scene where there were wolves, and that freaked me out. I didn't do that until my late teens, when I played the Anniversary version of the first game." Which Tomb Raider game is your favorite? "I would say the first Tomb Raider meant a lot, in the sense that I love adventure films, [and here was] a game where I suddenly could go to Egypt, or Atlantis - those were the worlds that I read books about and dreamt to go to when I was a child. That will always mean a lot, because I was quite young. Then the rebooted games I think are really impressive, because I love the fact that they've dared to go as far as they've done, relying on good storytelling. That it is a proper arc and feels very cinematic. That I think is very cool." Is there anything specific from the games you've included in your performance? "Yeah, I think the essence of Lara - even though she's changed in different forms over the years, it's her traits of being an extremely bright and clever, ferociously brave, curious young woman that I wanted to still bring. I wanted to honor her and all the fans, everyone who's been following and loved this character for all of these years. Then I think what I love with our film, what we could do, is bring the humanity and the vulnerability within her, for you to relate to her and root for her and feel the journey she goes on to becoming the action hero that we've known her to be." What did your four months of training involve? How does someone get a body like Lara Croft? "That's what I asked Magnus [Hollywood trainer Magnus Lygdback] when I met him the first time. [laughs] It was actually Alexander Skarsgard - who played Tarzan, he's a dear friend of mine, also Swedish - he was like, 'You need to have Magnus!' I was like, 'Am I going to look like you? Great!' [laughs] I used to dance when I was young, and that's kind of like being an athlete, that's how you train. I think I've always dreamt of being a part of an action film like this, to get the chance to. Also, I love to do very different characters, prepare in different ways, and here I got the chance. "They told me, 'This is your day job; you're going to have four months to prep for this role.' I wanted for you to believe that this normal girl, or girl from a reality close to ours now, can go on those adventures and do the kind of things that were in the script. I wanted her to be strong. I loved that it was integrated in the story that she trains MMA, that she's a bicycle courier. "It takes a lot of exercise and a lot of eating to gain the amount of pounds that I did for this role. [The muscle gain diet] is one of the things that you learn. You need proteins, but you need carbs too. I had three eggs in the morning, then two fillets of fish, and a bowl of rice, at 10:00, 1:00, 4:00, and 7:00. Every day, and you eat every third hour." "Yeah, it's like a chore. [laughs]"
How many of your own stunts did you do? "I did almost all [my own] stunts, because I'm in every scene of this film. I had such incredible stunt girls. I was floored by how good they were, and they prepped all the stunts whilst we were filming. I met the six of them at evenings after I've done a whole day's shoot, catching up on the things we were going to do next. Of course, there's certain things that they always go and do too, in case I wouldn't be able to do it. But I think if I look at the film, I did them all, then there's a few, three or four ones that were dangerous and they wouldn't let me do. I just got to stand back and watch these girls, like 'Wow'. "You know, going down those rapids - I did that, except for two of the highest [drops]. It was about 50 degrees in the water, so it's quite cold. I went down about 25 times with my hands tied. That was tough, but it was a cool feeling afterwards when I had done it." What would be your dream location for tomb raiding or adventuring? "I've had in my life so far twice when I've booked travels to Iceland, but I haven't been able to go. I would love to go. I was at the Faroe Islands filming for another thing, and it was just like being on Mars. I think Greenland and Iceland, the Faroe Islands, that would be cool." If Lara Croft, Indiana Jones, and Nathan Drake all went looking for the same artifact, who would get there first? Where is your Oscar that you got for The Danish Girl now? "I'm going to head out to LA tomorrow - that'll probably be my time when I actually go there and pick it up. It's been at a friend's house. Her daughter has taken care of it for about two years." Do you have a place in your home just ready to display it? "I think it was Kate Winslet who once said that she puts it in her loo, which I think is great. I also like when things are able to be usable. It would be a nice instrument for people to use the toilet brush; what if you just made it into the stick of the toilet brush? I've always thought that would be a good way. Then people have their private space if people want to hold it, but they still can use it. It would be great. They have a mirror, and they have some personal time. [laughs]"
Did you practice any of the exclamations that Lara makes in the games, when she's running, jumping, and so forth? "I joked about that when I started - and then you actually start doing the stunts. I remember, I saw the first video that the stunt guys do and was like, 'Well, I don't need to practice that. That actually just happens'. [laughs]"
Tomb Raider debuts March 16, 2018, and stands among our best upcoming movies of 2018. Check out the list to see what else awaits later this year!